This project was created on 12/24/2017 and last updated 2 days ago. pipossible causes: tangle/filament break; nozzle jam; power outage. Compatibility:Resumer 3D is compatible with marlin firmware based 3D printer, printing with SD card. Monitor: With this monitor box we can rescue a failed 3D print job automatically by press the OK button . Becuase of that it not just can detect the power off，but also can record every layer &apos;s information (through USB cable) while SD printing. Thanks for Hackaday!!! Where Can I buy Resumer 3D if I missed Kickstarter? Resumer 3D simulate the way of how 3D printer software works, sending out and receive G-code by USB port. By this way, when your printer is working, Resumer 3D will monitor the status of the 3D printer, record the printing data in real-time. Furthermore, there is a super capacitor built in Resumer 3D, even if the power shuts off unexpectedly, the super capacitor will keep Resumer 3D alive and store your printing data solidly. When you turn on 3D printer, as Resumer 3D has stored all the printed data, it can resume the prints fromany printed layer automatically. Resumer 3D makes everything easier. At beginning, many people are doubt that why Resumer 3D is so compatible as it can work with different 3D printers. Thanks to my team, we have tried our best to insert different USB drivers of different 3D printers; furthermore, as how Repetier-Host and Cura control 3D printer, Resumer 3D use the same way to communicate with 3D printer and control it by G-code command. You simply connect Resumer 3D to your 3D printer via USB cable, leave it alone. No headache of editing G-code, no afraid of technical problems when you choose Rasperry Pi. Although we have tested almost all the 3D printers that we can find in the market, we may miss some of them. If you find that your 3D printer is not compatible with Resumer 3D, please get in touch with us, our technical team will upgrade the firmware for you, please click here you can download the latest firmware. Thanks for your support. for upgrading the resumer 3d box firmware and settings. Use this software tool (for Windows) to check whether your 3d printer can be worked with our resumer3D box. 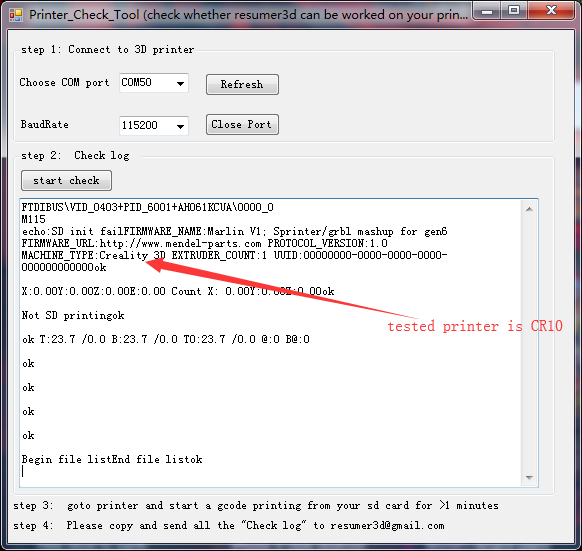 check 2 points: gcode command(marlin is ok) and which the usb driver chip your printer use. 2) open fan after resuming. How to make resumer 3D work with Filament detector? How to make resumer 3D work with Octoprint? How can I check the problem when Reusmer 3D does not work with my 3D printer? How to use Resumer 3D step by step after seting up? How to setup Resumer 3D with Mac computer? How to set up Reusmer 3D with Windows Computer? The mould of Resumer 3D has finished, and first batch will be 5000 Pcs! Resumer 3D really appreciate all your efforts, we have achieved 84% of our goals, and there are still 9 days to go, are you still waiting? We will ship all your goods on July on time as promised. By the way, could you kindly share this project with your 3D printings friends? They may also need this product. I tried to update the FW to 1.1.1 but stuck in boot loader mode. How can I flash the boot loader again? the ebay link has no option to ship to china. you are in shenzen and no shipping to china mainland ! why? is there any other option to buy from within china? taoboa? I am sorry for that, currently we do not sell this product in China online, if you need one, you can get in touch with me via wechat, my id is: foxtery Have a good day! Because of personal issue i mist the kickstarter. Is there a way to order this else where. Where i can get an resumer with shipping to Germany? Willl IT Work anytime with octoprint? Hi gehtdienixo, Thanks for support our project! now the shell mould is opening, and the resumer3D will be on amazon and ebay for sale in the middle of july. currently Resumer 3D could not work together with Octprint, however, our team is testing and updating the firmware, once it`s finished, they can work together. Did you ship worldwide? When yes i wil buy one if it is released ;). And how much will be the final price? 1) Will this work with control boards running smoothieware? It is set to Marlin in my slicer so I would expect it will work. 2) Will this work when printing Octoprint on a RasPi. 3) running the Printer_Check_Tool I don&apos;t see anything coming back from the printer except for temp readings. Once the print actually starts there is nothing. 2) I am sorry that currently resumer3d can not work with octoprint now. The controller board is a Panucatt Azteeg X5 mini. Hi john, we have not test on Panucatt Azteeg X5 mini, and maybe need to add this usb driver to resumer3d. so we will need to buy this board to debug. and will keep you informed when It works OK.
1) Resumer 3D only works on marlin based 3D printer. 2) Resumer 3d will work with Octoprint, my team is upgrading the firmware. Once it`s finished. it will work. 3) if you can send me the log to resumer3d@gmail.com? We will check it for you. first great idea! im current following the project and i wanna pledge on kickstarer but i have a question : there is two options one for $21 for the hackaday.io and other for $24 how they work? and im interest in get at least 3 units , please can you guys contact me how to to it ?. also is see on the list of compatible printers some missing brands , i have 4 different printer all different brands including a FLSUN i3 + , a CTC Dual XY core, a Lamchua XY core printer and a SUNHOKEY i3 with MKS v1.4 board if you guys need to test the device on any of this brands im willing to help. i located in usa ,New York. i hope ear from you guys soon, best regards odin. Thank you friend :) If you like this project, is it possible for you to share this project with your 3D printer friends? That will help us a lot. Thank you very much! Hi Trent Steele, thanks a lot ! Resumer3D will be on kickstarter this month ,we will keep you informed. Wow, I hate to even have to wait that long. I had a ruined print just recently that had been running for 2 days and stopped due to a Thermal Sensor Error. This product would have saved my print. Count me in for beta testing! How do I get one of these Resumer3D units? You can write an email to resumer3d@gmail.com, we will give you more details. How do you think that? You are about to report the project " Magical box for Resuming 3D Prints automatically. ", please tell us the reason.